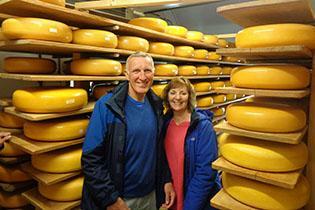 This tour will take you to the highlights of the Gouda area: windmills, lakes and cheese! It's a perfect tour for just a short break away from the busy city. Price: from € 30,- p.p. The next windmill is located slightly further on our way, also next to the old city wall: ’t Slot (the Castle) is still fully equipped as a corn mill but no longer in operation. In 1581, this location was the site of a first windmill built on the foundations of the demolished castle belonging to the lords of “Ter Gouw”, as Gouda was previously known. In Haastrecht, a very pretty town, we will visit a cheese farm to get a sense and feeling of the cheese making process. You will taste the cheese yourself here! Our next stop is at the Oukoopse Molen, which is a “wipmolen”. This type of windmill can easily rotate around its axis. 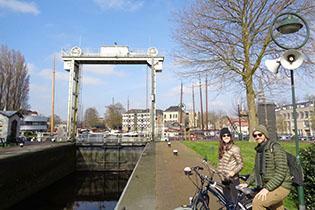 We continue our journey through the gorgeous lake district of Reeuwijk. Once this was a mining area for peat, but now you will now find a breath-taking nature reserve with a rich diversity of waterfowl. 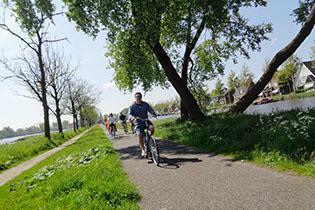 This bike tour will take you through this magnificent area and cross roads where cars are not allowed. Cheese farm visit. Pending opening schedules a cheese farm will be visited An additional charge applies, please inquire. Some of the windmills are open to the public. Pending opening schedules one of the windmills will be visited. Usually this is only possible on a Saturday. An additional charge of €2 per person applies. More than 4 add € 20 p.p. 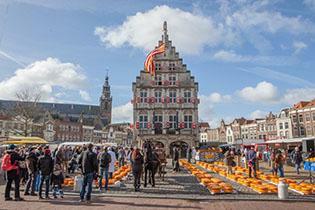 During the Gouda Cheese Market season (1 April - 31 August 2018) this tour is scheduled every Thursday afternoon, departure time 13:00h. Costs: € 30 p.p.